Weight Loss For The Military Moms Podcast: Ep 15 – What Does Eating Healthy Even Mean? 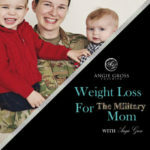 Welcome to the 15th episode Weight Loss For The Military Moms Podcast. All too often, when I ask people how they are eating, they tell me they eat really healthy. In this episode I talk about what it means to eat healthy for me and challenge you on what it means for you.